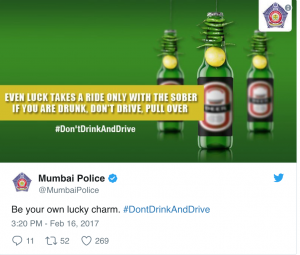 On account of the Road Safety week, which is being celebrated from January 11, Social Samosa takes a look at some of the most hard hitting and effective road safety campaigns in India over the last few years. According to a report on Road Accidents in India 2016, published by Transport Research wing under Ministry of Road Transport & Highways, Government of India,more people died on roads accidents in India in 2016 (4,80,652 accidents in 2016, leading to 1,50,785 deaths. ), as compared to the number of deaths in 2015.The port further stated that there are 17 deaths on road every hour. Among the major causes of road accidents are speeding and talking on mobile phones while driving. Over the years, brands as well as the government has tried to tackle this menace with the help of strong communication. 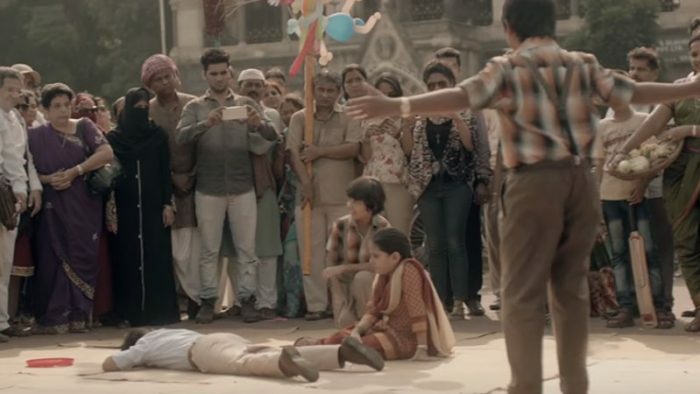 From using transgenders to children, from scaring people to using humour, brands have issued several Public service awareness campaigns to highlight the seriousness of this issue. 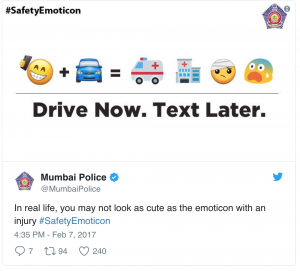 Mumbai Police is the best when it comes to handling serious topics with humour. They are known for donning the smart cap and handling any issue on social media at any given point of time. 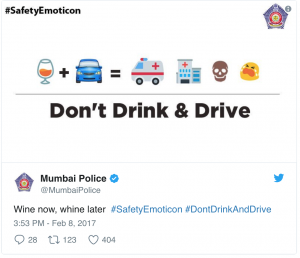 So when it comes to the serious issue of ‘Drive safely and responsibly’ and ‘Don’t Drink and Drive’, Mumbai Police never disappointed the Twitterati with their interesting social media posts. Transgenders, we do see them on roads right? But how many times do we think of listening to what they say. Ogilvy India’s ‘The Seatbelt Crew’ showed eunuchs as protagonists to highlight the importance of using seat belts while driving. The campaign has been applauded by many and has won several awards at prestigious fests. Drive Safe Dad by CEAT campaign originates from an innovative idea that blends emotions and technology in one package. In this initiative, in the video, Dads receive a personalized bobble head (handcrafted to resemble their kid), which is connected to the odometer of the vehicle. On over speeding, the device plays the recorded personalised message from their sons or daughters asking them to slow down. Vodafone and Save Life Foundation released this hard hitting campaign last year titled ‘OK TO IGNORE’ to highlight the hazards of distracted driving. These Public Service Awareness campaigns, featuring around the lives of different people had a simple message to convey ‘Use helmet’ and ‘Don’t Drink and Drive’. It was more aimed at targeting the masses. Samsung released this very powerful campaign in association with the Ministry of Road Transport & Highways, which urged people not to click selfies on road and to use their mobile phones responsibly. According to a shocking statistics shared at the end of the video, India accounts for more than 50 percent of the total selfie deaths in the world. Hero Moto Corp released the video ‘Ride Safe India Road Show’ , where kids were on the roads enacting a skit to drive home the message of ‘Just don’t stand and be a mute spectator in case of a road accident’, one should call and ambulance immediately, it can help save few precious lives. Featuring actor Shah Rukh Khan, Hyundai in their #BeTheBetterGuy campaign, highlights critical issues pertaining to road safety such as– Under Age Driving, Don’t Drink & Drive, Usage of Mobile Phone, Over Speeding & Violation of Traffic Signal. Looking at the popularity of the previous campaign, it came back with its second part in 2017. The first campaign has won several awards. Droom, an online automobile transactional marketplace, in their campaign “Talking Gods” warned people to drive slowly and safely. HP Lubricants released a film that captured how the intense steep and narrow roads lead to awful casualties and fatal accidents especially on the hairpin bends wherein both vehicles are unaware of what’s coming from the other side and end up crashing. Through the innovation of #RoadsThatHonk, HP Lubricants placed smart poles with radar technology that communicated with each other to alert drivers on both ends by making a sound of the horn. Which is your favourite road safety campaign? Let us know in the comments section below or write to us at team@socialsamosa.com.